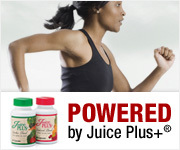 I encourage all clients and blog readers to add Juice Plus to their diet. This simple combination of fruits and vegetables in capsule or chewable form allows you to benefit from a wide variety of nutrient dense produce every single day. All the reasons your mom told you to eat your fruits and vegetables apply to Juice Plus. Everyone can benefit from whole food nutrition. Juice Plus also offers a whole food meal/snack replacement shake called Complete that I regularly mention in blog posts. Complete bars come in several flavors. And the Juice Plus Tower garden is a simple way to garden, even in small spaces.